I’ve owned countless used cars that have been abused by the Northeast’s terrible winters, that have suffered from bizarre mechanical maladies and have been downright horrible decisions on my part. But none have made it out as well as my recently purchased 184,000-mile Honda S2000. For the first time since I purchased the car a few weeks ago, I got the car up on my lift for a better look. As someone who has had numerous high-mile project cars—Porsche 944s, one-and-a-half BMW M5s, an ‘80s Subaru rally car—I was basically expecting the underside of the car to be covered in rust and oil-packed road dirt. Not only was there no rust to be found, and there were barely any leaks! The transmission wasn’t leaking, the differential wasn’t leaking, and the engine was barely leaking. Or at least might’ve been leaking at some point. To my eyes, it was like this thing just rolled off of a dealership lot. I’m pretty sure my 2017 Subaru WRX STI with 21,000 miles is already showing more rust. OK, fine. It’s not perfect, but damn, it sure is clean. If I’m being completely honest, the lack of leaking oil wasn’t a total surprise. The previous owner informed me that he replaced some gaskets and did some other light engine work right before I took the car over. Apparently, when he first got it, the engine was basically pouring oil. This would also explain why it looks like the engine has been cleaned up a bit. As for the rust, a look at the car’s registration history shows that up until now, the car has barely been near the northeast. 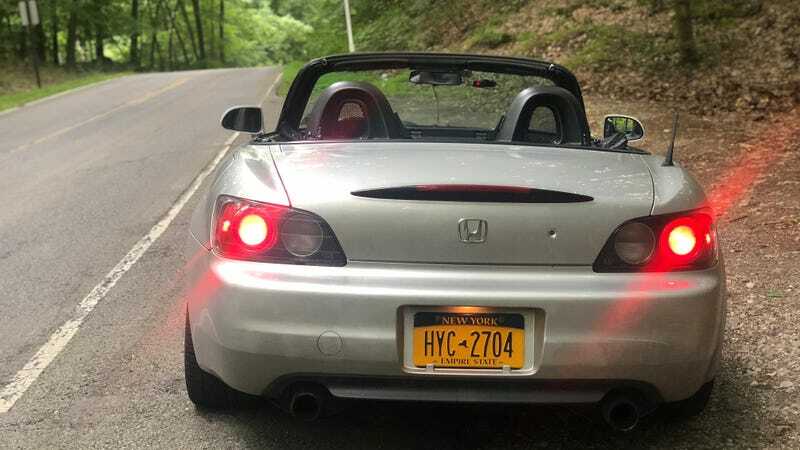 I bought it from a seller in Pennsylvania who had it for a very brief period, but before that, the S2000 started out in Alabama, then made its way to Virginia and later Utah, according to a Carfax report. I don’t have much experience buying cars from any of but these other states, but I imagine their used car markets aren’t packed with terribly corroded vehicles like it is here, up in New York. While the S2000 was in the air, I broke open a few drain plugs and did some light, post-purchase wrenching. I put some heavier and higher-quality motor oil in the engine to try and limit oil consumption while in VTEC and also flushed the transmission and differential fluids. I swapped the car’s positive crankcase ventilation too, hoping that doing so would also stop the car from coughing up so much oil smoke. Ah. Metal shards clinging to the magnetic drain plug. Guess you can’t win them all. As for the bushings, brakes, and parts of those sorts, everything I glanced at seemed to have a decent amount of life left. That is, aside from the rear right tire, which is basically bald. Anyways, it’s always a relief to find out that the car you just acquired doesn’t appear to be a complete pile of trash. What&apos;s the Most Important Maintenance After Buying a Used Car?